Due to work and life, I haven’t had a great deal of time to go actively searching for new stuff this year. But, ironically, due to the fact that we’ve been working crazy-late hours the last couple of weeks, I have been able to listen to hours of random playlists and been able to toss a few tracks I’ve liked to my own Spotify (RIP Rdio + please hurry up Pandora Premium) playlist. Some of you who have followed along for years might know that there’s a few tracks I think are imperative to a quality, heavy-rotation Christmas playlist. Some of them aren’t available on music services and only exist on the hard drives of folks like you and I; it’s up to us to carry the torch for the next generations. Heavy burden, I know. 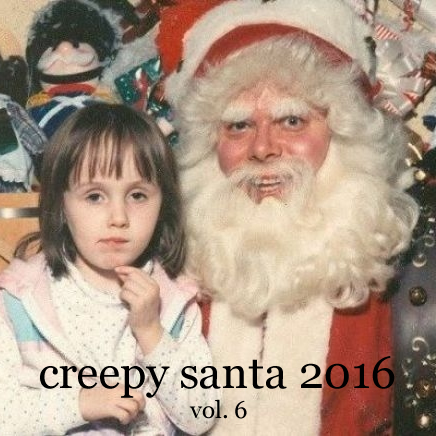 Those tracks aren’t on the Spotify version of Creepy Santa below; if you want the extra good stuff, you’ll have to download the ZIP folder and play it the old fashioned way (iTunes). If you’re new here, you might check the archives for past freebies. If nothing else, the download might be worth it for the smiles track 20 can induce; it’s a modern day take on the creepiness that is Baby, It’s Cold Outside.